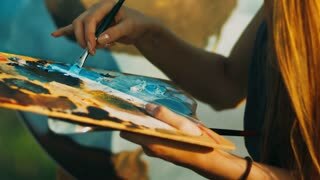 Close up of hands holding wooden palette on her hands and painting in the studio. Close up of female hands holding wooden palette on her hands and making her new masterpiece in studio. 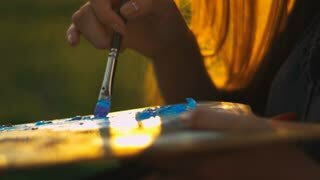 Close up of creative painter holding wooden palette on her hands and making beautiful colors in studio. 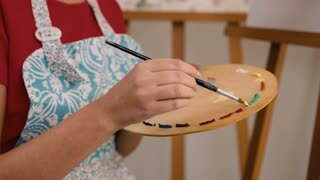 Painter holding wooden palette on her hands and making her new masterpiece in her studio. Close up portrait of drawing girl with wooden palette in her hand. Young positive painter holding palette on her hand paints in her art studio. 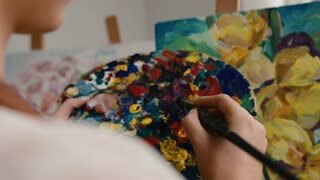 Close up picture of painter holding paintbrush and color palette while working on oil painting of flowers.